I am often reminded by the actions of my customers how kind and thoughtful they are and at times I am taken by surprise when I am at the receiving end of unsolicited acts of kindness from people I know only from afar. They usually touch me with their words and their personality through the phone and emails but this time the surprise came in a small box. I opened an unexpected box at the store that was addressed to me and smelled suspiciously familiar, which contained a bag of coffee beans and the sender (I learned later), was Hilary. Hilary sent a bag of Italian dark roast (originating from Il Fornaio in CA – a restaurant with which I have no affiliation financial or otherwise). At a first sniff the roast smelled like Turkish coffee and the beans, while bigger, have the pale roasted look of Turkish coffee beans. Dunking my nose into this bag became a hourly pleasure and I kept asking the others in the store to do the same. I decided to take the beans home for testing and found that my faithful coffee maker of 4 years had given up on me. The plate was not heating. I was sad but I though the $30 investment for this coffee maker was well returned and started looking for a new one. After a little bit of research I decided to try a Cuisinart 12 cup coffee maker – warning, a frank product evaluation is about to follow. 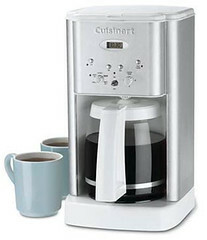 If you find this coffee maker by Cuisinart on a substantial sale I would suggest you walk the other way. I for one would not take it if it was given to me free (and it was, I used credit card points and therefore, I am stuck with it). It makes by far the most hideous-rank cup of coffee I have drank and I have drank a large selection of not-so-good cups of coffee. I think if there was a punishment-by-coffee it would most definitely be made with this drip coffee maker – what a waste of good coffee beans! This coffee maker by Cuisinart fails to heat the water to a degree that is necessary to brew a good cup of coffee leaving the drinker with a sour and odd tasting concoction that is barely warm even immediately after brewing. If you leave the coffee in the carafe long enough the plate may heat it up a little bit but I found that the coffee starts smelling almost moldy-sour-burnt after 15 mins on the plate. Here is an analogy, think of your sink full of dirty dish-water from night before. Then imagine pouring coffee from previous morning into the sink and dipping a mug into that water and drinking it. 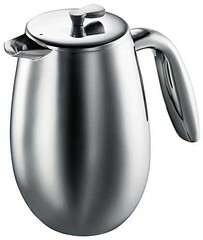 For me the experience of drinking a cup of coffee from Cuisinart’s coffee maker is exactly the same. Long story short – I now have a useless coffee machine. Do you guys have any suggestions for an alternate use for this contraption? So I decided to try my beans in a French press by Bodum instead. French presses in general make a pretty stiff cup of coffee, much more so than drip coffee makers so I was cautious when I ground my beans and measured them with a shy hand. I found that this was a smart move on my part as the Il Fornaio Italian roast makes one strong brew. 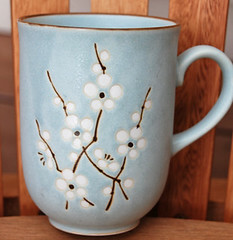 I picked my cup and went for my first sip (one must have the right cup for the brew – this was a Japanese made mug that I scored at Uwajiyama, a major Asian grocery store at Seattle’s International District). 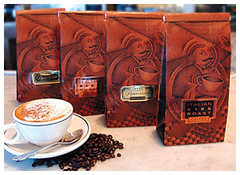 Il Forniao’s Italian roast is not a coffee for the light hearted coffee drinker. This is the true coffee drinker’s brew. It is earthy (I mean that, really earthy! ), with a definite aroma of the darkest chocolate, coffee liquor and may be a hint of Turkish coffee’s nutmeg. If coffee could be rated as sweet and dry (similar to wine), this is the driest end of the spectrum. I found no after taste or burned coffee smell even after 30 mins in my carafe tho it did sour a tiny bit. Still, I went for a second cup after 30 mins and drank with a smile. No major caffeine rush but a great zip for the morning. Thank you Hilary for your kindness and for introducing me to Il Forniao’s Italian roast. I am now in the market for a new drip coffee maker. Any and all suggestion would be appreciated. Wishing you a great Labor Day week. Those of you who know me know that I like to drink coffee. I drink one cup of coffee a day, in the morning, like a cat’s chain event, must have coffee before functionality. This is a little odd – even to me – because I come from a tea drinking culture…I was raised in an environment one drank tea hot even when the temperature soared over the 100 degree mark. I liked my tea with significant amount of sugar, which has carried into my coffee ritual. Though I never drank cream with my tea, I have to have an exact amount of cream with my coffee (1 teaspoon). Maybe because I drink only one cup a day or maybe because I like my coffee to taste good I have become a little selective. I admit, I do live in Seattle, the land of Starbucks and home of the fancy coffee drinkers land but I have never had to utter more than ‘a medium cup of coffee please’ when ordering at Starbucks, or Tully’s or anywhere else for that matter. I have been living in Seattle close to 7 years and I still can not remember the proper names of the coffee sizes, venti, grande, small, medium…someone help me please! I do admit to ordering the occasional shot-in-the-dark (cup of coffee with a shot of espresso), but that is only when I know that the coffee is weak and does not taste particularly well. Ummm, I will keep that coffee experience to myself for now. But what I like the most is making my own coffee. Buying my beans, grinding them first thing in the morning, the smell, the sound of the machine percolating and picking ‘the cup’ for the day. One must have the right cup! The rim cannot be too thick or too thin; the cup cannot be too big and/or have a wide mouth – after all who likes to sip coffee poured 30 minutes ago or be able to dunk face into it. 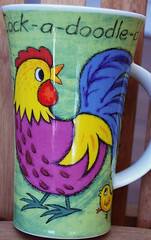 This is one of my favorite cups. I bought it while shopping in Bracknell, UK. 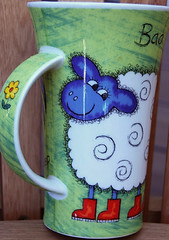 It is adorable with the sheep and a rooster painted on it and a little peachy sheep painted inside the cup. I especially like the fact that white sheep on the outside has a blue face, reminding of Blue Faced Leicester while drinking and making me smile (as though it is not enough to be sipping delicious java goodness). I must admit, I have been having difficulty procuring/finding nice cups that are made in the US or for that matter simply not made in China. Did you know that tableware made in China has been found to have lead in the glaze!? Not tableware, but I had to pack up and return 50+ pieces of Thomas the Tank Engine (made in China), to the manufacturer as a part of we-found-lead-in-the-paint recall. What worries me most is the fact that my babies played with these toys (those of you who have small children know that everything goes into the mouth), and ate from plates made in China. Before I quit this not-so-pleasant portion of my post, please share with me your online sources for tableware and/or coffee cups that are lead free. Of of topic, I was in Bed Bath and Beyond to purchase some tableware and I could not find one single piece of china that was not made in China! That blew me away. OK back to topic, for that one single cup of coffee one’s experience must be as close to perfect as possible. 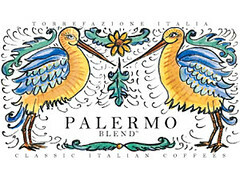 This is when Torrefazione’s Italia Palermo blend comes into the picture. To put it simply, this blend rocks! It is deep without being bitter. It is strong without making your hair curl and leaving a bad after taste. It smells like coffee (duh), with a hint of dark chocolate and sunshine (the latter bit re sunshine made up by me). Great aftershock without leaving you with the why-did-I-drink-that-coffee shakes or the heart burn (if you ever had over roasted coffee you know what I am talking about). This is the coffee drinker’s coffee. Perfect even without sugar (hark), and great with a fresh baked scone or a slice of bread with butter and honey. PELASE NOTE – I have no financial affiliation with Torrefazione nor will I benefit in anyway from this post. That is all from me tonight. I know this is supposed to be a blog about knitting related matters but for me coffee is closely related to beautiful yarn and knitting. I hope you enjoy reading about my coffee adventures (hint more coming later).